The DMR revolution started with the MD380! and bootleg features became the average man’s DMR radio. I have several! Later the MD390 became available as a more robust version of the same radio. Features – especially with cracked firmware which allowed large contact lists and FPP features. See above – simple as that! Really nothing bad to say about the radio. For the money it is great. Is it Part 90 or not? It has the typical Chinese radio programming software. Nothing fancy, but functional. Again for the $$, what do you expect. This is probably the best radio for the cost. Due to the cost, it is my loaner radio. 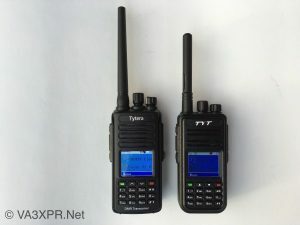 I have equipped entire events with DMR radios by using a fleet of used MD380’s. Not a huge issue if it is lost or breaks, all due to the low cost. Great way to get your feet wet in DMR to see if you like the mode!